Illustrated panel prepared by volunteers from the East Melbourne Historical Society as part of an exhibition,For King and Country, commemorating the centenary of the commencement of the First World War. 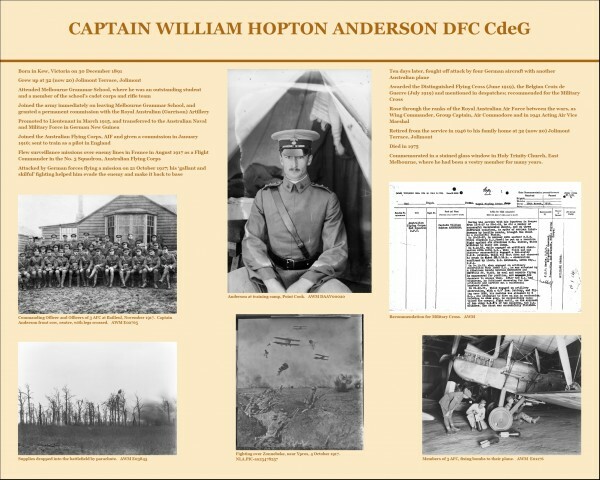 It is one of 16 panels, each of which provides a life story, with relevant images, of men and women who served in the war and who had connection with East Melbourne or Jolimont. Designed by Francesca Black, printed by Snap Abbotsford.